We service high schools, middle schools, elementary and pre-schools. 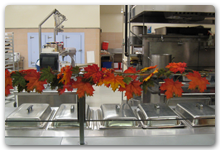 Our philosophy and experience with healthy dining provides the back drop to the National School Lunch and Breakfast Program. We provide menus that appeal to your unique students and staff. Our recipes include USDA approved recipes that meet the requirements to keep our youth healthy. 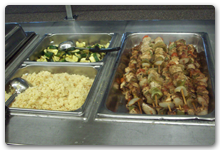 We customize our menus with ethnic foods that please the majority of your students and staff. Many recipes are “customized” to maintain the nutritional components to provide and ensure maximum reimbursement and healthy meals. We deliver tasty and healthy meals to schools. 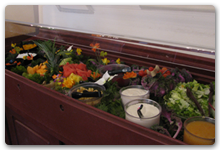 Our meals are prepared using fresh ingredients. Low sugar and sodium content are always factors in our recipes. Every child’s education should include healthy eating. Our meals are healthy, tasty, home-made, affordable and reimbursable. We take pride in our menu creation process, involving student, staff and parent participation. We actively solicit feedback from the students to help us ensure that we are serving food that our students and faculty love to eat! Lunch: We offer a lunch menu based on the preferences of your students. Health and nutrition are always an important consideration with the menu planning. FMA menus follow the NSLP Menu Planning Guidelines. Every lunch includes fruits, vegetables, a healthy carbohydrate and lean protein. Breakfast: Our menus include the SBP Menu Guidelines. Every breakfast is served with hormone-free milk. Fruit is always a component of our meal. Breakfast items include yogurt, cereal, bagels, muffins, fresh cooked eggs, etc.